WHILE some would fall into depression when bullied online, Sen. Nancy Binay chose to turn her experience with online bullies into something positive. “It is a ‘slam book’ type. I have tips on how to deal with social media bashing, how to have your friendship on social media. Yung side ko at yung side ni Senyora (My side and the side of my basher Senyora),” she said during her Cebu book promotion. Binay admitted that even though she won as a senator in the 2013 elections, she had to deal with social media bashing because of her skin color and the way she dressed in public gatherings. “I cannot control kung ano ang sasabihin ng ibang tao sa akin (what they say about me) but I can control how I react to it,” she said. As of this week, Binay said her book is No. 6 in the top 10 best-seller list of National Book Store. 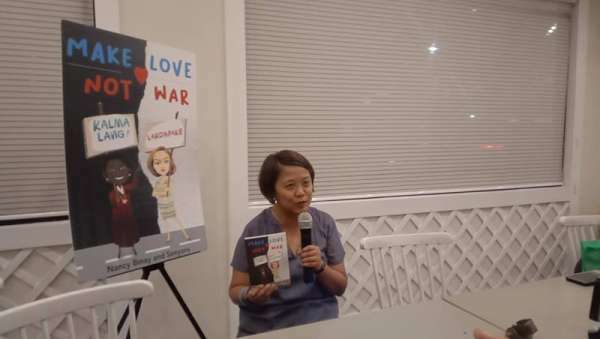 Binay considered her second published book, “Make Love, Not War,” initially launched in Manila during the first week of December of last year, as a successful collaboration with her No. 1 critic Senyora Angelika “Ganda” Santibañez. Senyora is a parody which became popular as the voice of a merciless haciendera. Binay clarified, however, that until now, she has yet to meet Senyora in person. The ABS-CBN Publishing book is sold for P185 each and is exclusively available in all National Book Stores. Binay also introduced to media her first written and published book titled “Charcoal Confessions” which she termed as one of the real fruits of her love and labor. This book is yet to be released. “It contains 45 tips on how to survive social media bashing. This is the fruit of love and labor,” she added. Binay will revise some parts of her first book in time for her 46th birthday on May 12.